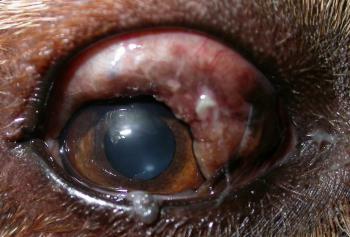 This ten year old labrador is presented with a mass protruding from its upper conjunctival sac. When the dog gets excited or the mass is knocked it expands dramatically, as shown here, only to return to normal size after about half an hour. What might this be and how would you manage it? This is a mast cell tumour, which degranulates liberating histamine when mildly traumatised. I thought we might be able to dbulk it substantially by surgery prior to some chemotherapy, but our oncologists thought that prednisolone and chlorambucil orally would have the same effect. This has just about turned out to be the case as you can see here after two weeks. 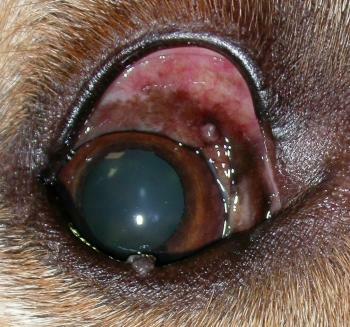 It hasn’t cured the problem, but then neither would surgery longterm I guess unless we exenterated the orbit which the owners weren’t keen on, given that the other eye is already blind. Control seems the best option rather than cure. This entry was posted in Cases and tagged dog, mast cell tumour. Bookmark the permalink.